-Drum shade from Armour & Co (the store was within walking distance of our home in Atlanta) In the clearance bin I found what is now my dining room fixture- for $20! I hired an electrician here in Nashville who made it happen (no conversion kit was used) and presto! Never underestimate a clearanced item you can repurpose! 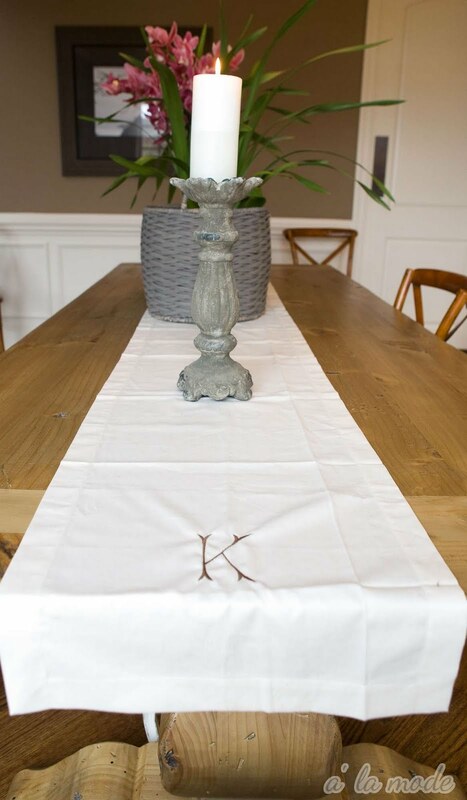 -Drapery panels are from Potterybarn, Peyton Grommet Drape, Oatmeal, 108", $109 per panel--I have these in every room of my house on the main floor. Love, love, love the candlesticks! And the crossback chairs at $16? Wow! 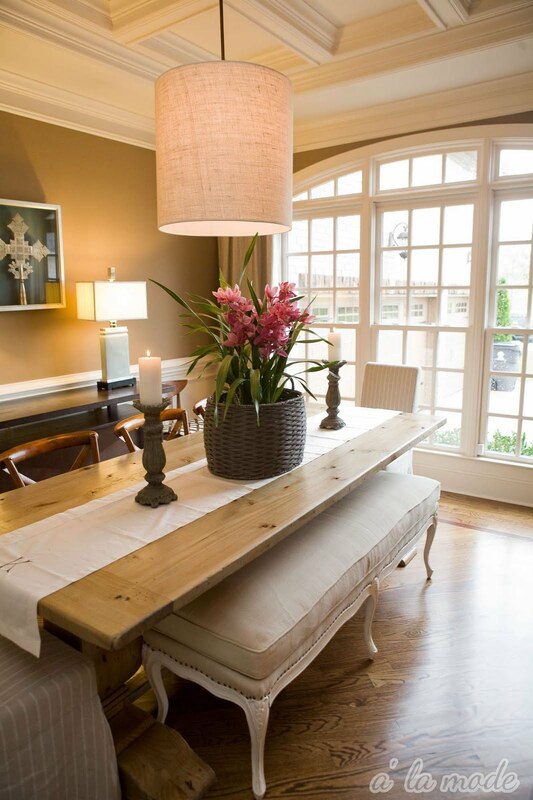 Your dining room is beautiful, Shelli! I love your bench and that drum shade really is wonderful. You've done a great job! I love your dining room! All of the pieces are unique and work together so well. 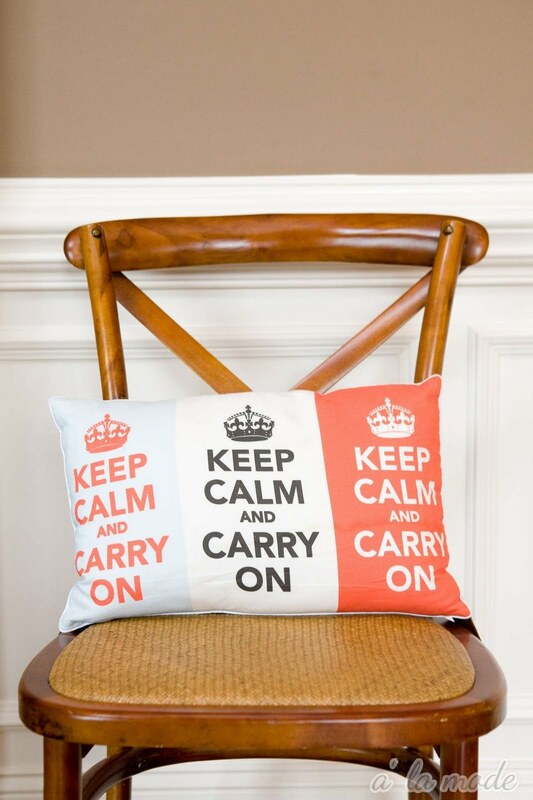 Where did you find the keep calm and carry on pillow? I love it. Thanks girls! And thanks for leaving a comment, they make me giddy when I get them! @Aileen- I'll give you 3 guesses and the first 2 don't count, lol. Ha. TJMaxx, baby! I think we have the same table in our dining room, except in the darker finish! Love those legs! Gorgeous! I so love the architectural details in that room! The additional of the bench is PERFECTION!! L-O-V-E your dining room & glad that I found your blog, it's one of my top 5 favorites and come everyday for inspiration. the bench is my favorite part! 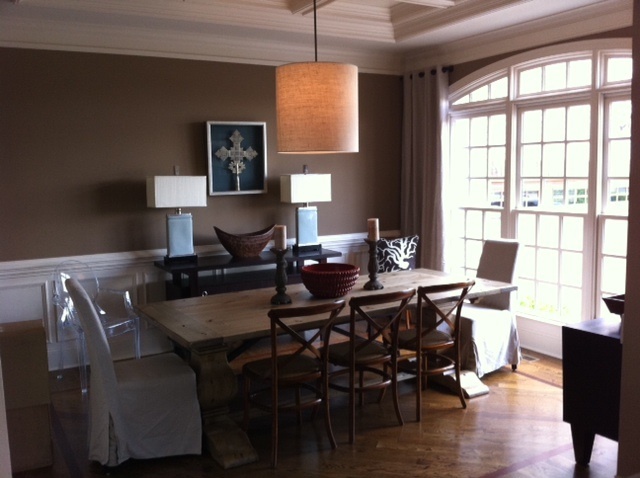 Could you please share your dining room paint color? It is perfection! I love your home--so much inspiration. Your style is amazing. I am so excited to start following your blog. The dining room paint color is called Wild Country and I did a post on paint colors last night if you click on home tour, it should pop up! Thanks for stopping by and for the sweet words everyone! Happy Easter!! Your home is beautiful!! I love the bench and the little touches you have throughout. I was wondering where you got that table. It is gorgeous! Thanks for sharing the details for your beautiful home. Where did you get the dining chair covers ? Love that bench. Great placement. 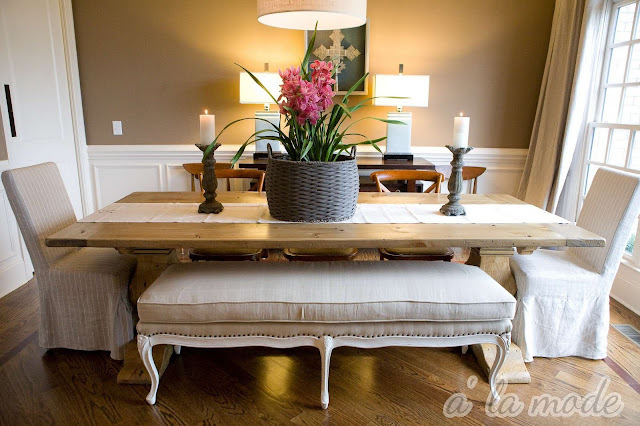 Lovely room..Love the bench and the planter! 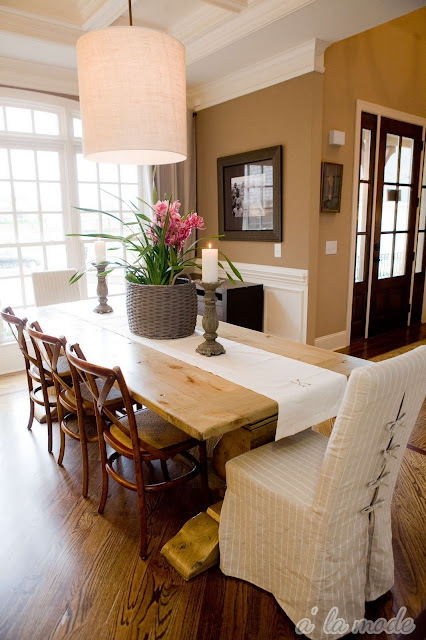 Shel, your dining room is amazing! I love everything about it - the colors, the table and chairs, the light, oh and your ceilings are gorgeous! Thanks so much for linking up! This is beautiful! Where did you get that table?? You did a terrific re-do of your dining room. My favorites are the runner, the beautiful table and the centerpiece. Your dinning room is adorable. I love it Shelli.